We arrived at the Bills Lake 1 in Chalons en Champagne for 9:00am Saturday 14th October. On arrival we took a swift walk around the lake to take a closer look at the swims before the draw was to take place. KARPER team member Craig Horton and I had decided before we left for the trip that we were going to double up and take a pick of one of the double pegs on offer, this giving us the chance to work together. This been my first time fishing in France I found myself experiencing butterflies and had the excited but nervous feeling knowing what was lurking in the depths and what we could potentially end up hooking!! We already discussed the 3 pegs we would prefer to fish in our minds following our walk around the lake, Point, Poachers or Treetops. I let Craig pick the number out of the draw unfortunately we came last in the draw but still managed to get one of our 3 chosen swims Treetops double swim!! Now came the time to get round to the swim and unloaded our gear! Time to flip the coin for who was going to have the pick of either side of the swim, Craig had the winning pick and decided to choose to fish the right hand side of the swim. I decided to just sit for half an hour or so and watch the water that would be mine for the next 7 days, this gave me a little thinking time to how I was going to approach my swim. I had a left hand margin and a far margin running down the side of the lake. Whilst watching the water bosh! Out smashed a big fish along the far margin, after witnessing that! I had to put a rod over to the far margin where the carp had shown. Craig decided to get to work with the marker rod to locate the gravel bar that ran down the centre of the lake for his open water spots as this was the main feature for him to work with and fish. He decide to fish 2 rods on the bar and 1 to the right hand margin. We got the distance sticks out and counted the wraps 12 wraps, we had found the bar. I had already decided to have 2 margin spots so chose to stick the third rod on to the gravel bar. We both decided to start off by fishing with very little bait and singles for the first night. I put a single out to the gravel bar and used the bait boat with just a small handful of particle and a few KARPER Streamerz pellets thrown into the 2 margin spots. I felt that I could quite easily get my rigs presented nicely this way along the treeline margin spots. 5:30pm came before we knew it and it was time to go round to the cabin for our evening meal. This gave the swims a rest for half an hour or so each evening throughout the week, also giving us the chance to put fresh baits on for the night and top up the spots with lose feed bait. That night I was woken by 2 runs both off my margin spots but when I hit into them sadly there was nothing on the end! Both times the multi-rig had been done! I didn’t worry too much as it was the first night and I knew I was in it for the long haul. As the week and days progressed the weather temperatures started the rise hitting 24°C increasing the high pressure throughout the daytime but during the nigh the temperature was dropping to around 10°C with heavy dew and virtually no cloud cover what so ever which made the fishing extremely difficult. 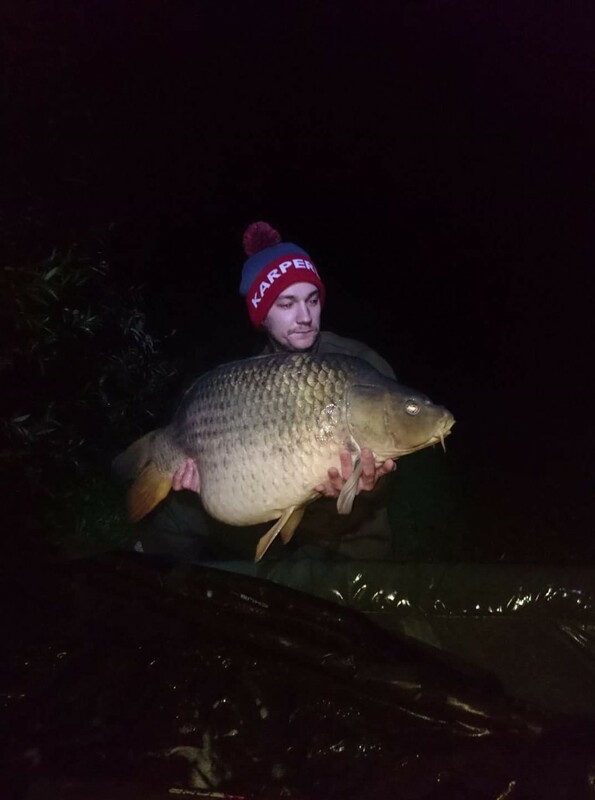 KARPER Team member Nick Malbon was fishing the Point swim which looked onto the lake’s island and a little corner bay, he managed to get off the mark banking a lovely well deserved 25lb 4oz common on Monday night this was also the first carp to be banked out of the whole lake since our arrival on the Saturday. 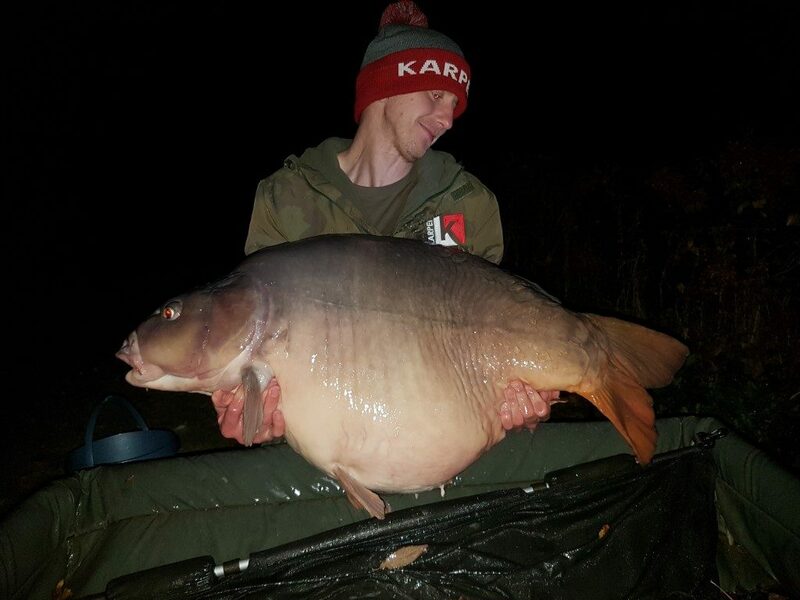 Nick chose to fish his usual tactics a KD rig fished with a trimmed down 16mm bottom bait and Squid & Octopus KARPER pink as a snowman. This gave us a little boost and raised everyone hopes for the following day! The next morning came and I sat watching for shows or any signs of carp then casting to them but soon realised these carp were easily spooked and I would be better off sitting on my hands and spots as hard as I was finding it to as I was eager to get off the mark. 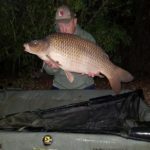 During the night times the carp seemed to be putting on a display over the open water spots and along the margins but just would not get their heads down on the bait. A couple more carp had been banked after Nick’s from around the lake that morning, all the carp banked had fallen to bottom bait rigs we both decided to tie up some D- rigs and fish heavy on the bottom using 16mm bottom baits with 10mm toppers as a snowmen rig. Pop-ups just didn’t seem to be working! With the aborted takes we had experienced, Craig had also had his Multi-rig done on one occasion previously. Tuesday evening just before meal time we put fresh baits on the rigs and got the rods wrapped up. Back from tea knowing we had the gravel bar baited after putting out around 10 to 15 Spomb’s out earlier and hadn’t had a fish from it we both decided to just put out singles back out onto the spots. I had seen very little activity on the margin for the past 2 days so I decided to release a bit of pressure from the far margin and put 2 rods to the bar leaving me with my corner margin spot still persisting with a pop-up rig down there as there was a bit of a chod on the bottom. Once again the night carp were showing all over our swim, at around 4:30am Craig was woken by a 1 toner, all I heard was Kyle am in!!! Yes Craig was finally in after four days one of us was into the first carp of our trip and another great looking common graced the bank for the team from the gravel bar. 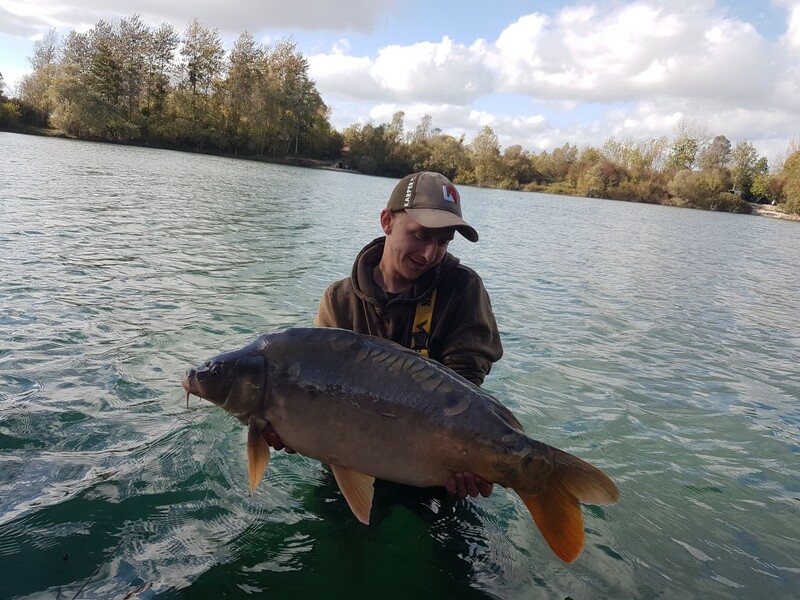 We got the fish up to the tripod and it tipped the scales round to 28lb 6oz, this was just what we had needed with the conditions been so challenging. The following day like all of the other days previously the action and activity in the swim was very quiet during the day, again like all the other days we reeled in to go around for our evening meal this time a little earlier to take a walk around the lake to see the other lads and find out how they were getting on. After our meal we returned to our swim and put some Spomb’s of bait back out onto the gravel bar, I also decided to go back to just dropping a little bait to the margin with the boat slightly off the pre-baited area this seemed to get me the two dropped pick-ups previously. Back to the swim and rods back out ready for the night ahead with very little showing we called it a night and hit the sack for some sleep, at around 3:00am Craig had hit into another carp this time it was to a 16mm bottom bait with a trimmed down 12mm pinks, I was flat out and didn’t hear him calling me until the carp picked up my line for a moment I thought I was in then when I got out of the bivvy I could see Craig was playing a fish. Another common in the net, unhooked and left in the net to rest. Craig had run out barefoot and went to get his boots on, I went to reel in so I could reposition my rig, and little did we know what was going to happen next! As I started to reel in I noticed a common slowly swimming back into the depths about a rod length from the bank!!! It then clicked the fish had escaped the net, I was the one who had to break the bad news to Craig, this really knocked us both right back down earth and I sat in the bivvy with my head in my hands blaming myself going through all the if’s and buts as you do. Thursday morning arrived and the last thing I want to do was get up after what had happened the night before, we spoke about it and had to laugh about the error that had been made, the pressure had gotten to me that much I was ready for home but I managed to pull myself together. We went about are usual day and tactics. We got to work again with the Spomb and this time we decided to introduce whole 14mm and 16mm boilies as that seemed to be picking carp up from the opposite bank. That night was quiet with not much activity to be seen or heard and the bobbin’s remained static. 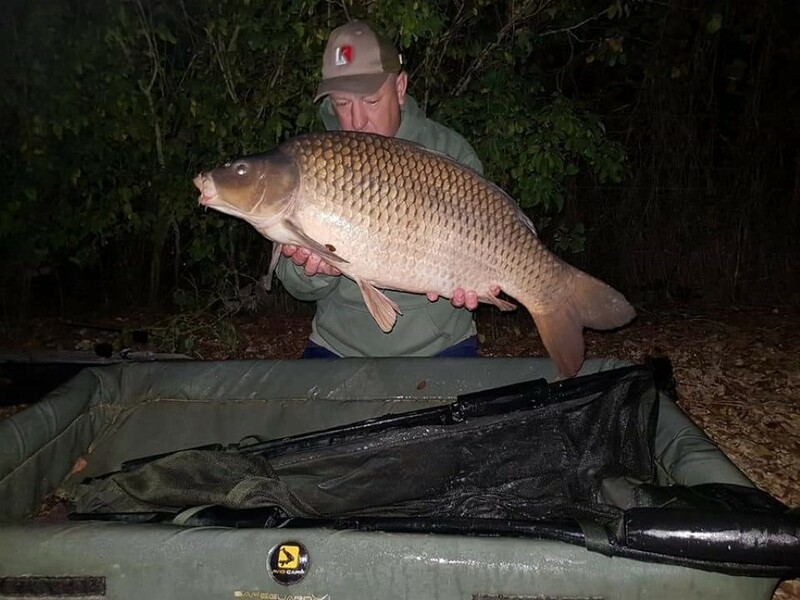 A report came in from Nick Malbon that he had a run but lost it that was the first sign of any fish been in his swim since he had banked the common earlier in the week. Friday came around and I was ready to accept the blank in fact I had! and was just looking forward to getting home to my girls. However the weather temperatures and air pressure had changed for the better, wind with a little cloud coverage it looked spot on even though I had a little doubt in my mind with me been on back of the wind. I made a phone call to nick around 2pm to see if there were any signs of fish down in the bay as the wind was pushing down that way and to see if it was worth taking a walk down there to try stalk one out. I decided to stick to my guns and sit on my hands, with hope that they had to come on to this bait we had put in with the change of weather. 15 minutes later a carp boshed on the spot over my middle rod then again 3 shows in 20 minutes on the baited gravel bar and this was unusual for the time of day from what we had previously experienced during the week. It went quiet so I decided to go for little lie down just as I shut my eyes the rod melted off!! 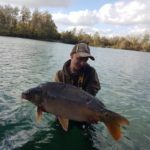 I was into my first ever French carp the choice to sit on my hands had paid off. As I was playing the carp Nick came up to give me and Craig some chocolate mousse to boost our morale, not knowing I was into my first carp! I got it in close, as Craig scooped the net cord under it there was only one thing to do “Yes, come on!” With dance for joy. We had a quick look at it in the net then set about getting it weighed and photographed. On weighing the fish it became clear it was a new PB beating my UK PB mirror by 5lb, I put on the waders and jumped into to the water to get some shots as wasn’t sure I’d have another chance to do so. Weighing in at 25lb 4oz of French mirror it was a new PB and had fallen to a 16mm bottom bait topped with a 10mm KARPER Chocmint Dispersion fished on a D-rig. I put the rod back to the spot and decided to scatter another half kilo or so of wholes over the spot. I could reel in and go round for the last meal smiling from ear to ear, having finally banked a fish and a new PB, anything else now was a bonus. Back from our meal and set about getting the rods back out with confidence. We sat and reflected on the challenging week we had encounter whilst having a few cans to round off our week. At around 9:15pm bleep! I put the head torch onto the bobbin and watched it slowly rise into a one toner it absolutely melted off we both jumped up out of our chairs to get to the rod very nearly going head first down a 3ft drop after tripping up over the boat above the stair leading to the rods. This time it was a common in the shape of a torpedo it was not happy, almost flat rodding me 3 times I got it under control and into the net. I could not believe how long n lean this common was and how big its barbule’s were. 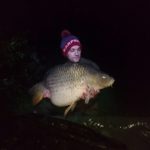 Weighing 28lb on the nose falling to a 16mm bottom bait with a 12mm trimmed down KARPER pinks, this common gave me a fight I’ll never forget. I put the rod back out on the spot and scattered another 30 to 40 more wholes over the top. After that we had a laugh about how we must of been in kiddies corner as our carp didn’t seem to be going above 30lb, the time came to get our heads down ready for the long journey home. I heard an alarm looked out of the bivvy, Craig had just recast after having a bream. So back off to sleep I went. 5:15am 4 bleeps on the middle rod and a shout from Craig I ran down to the rod and just before I hit into it went again with another few bleeps. I was into the 3rd carp, I kept feeling the line flicking off its fin’s, in close and it made a dart for the margin where there was a small weed bed. I managed to get it turned, that was when we saw the unit of a mirror but neither of us thought it were as big as it was, we estimated 50 to 55lb but we knew it was going to be the winner of £90 wager we had going for the biggest mirror! I went to go get my t-shirt and smock as I didn’t have a top on and very quickly got cold after the fight had finished. Struggling to lift it out of the water I could not believe how my luck had changed in the last 14hrs. We got it on to scales and realised we needed a bigger set!! I quickly ran down to wake up Nick to borrow his whilst Craig kept the mirror well-watered and settled in the cradle. 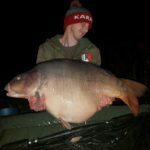 Nick came back up with me to see this unit, he was as buzzing as me, we got it on the scales after we had got some photos taken of the beast it tipped the scales round to 30kg 66lb of monster French mirror carp. I struggled to lift it and took me a few times to get it into position for the photos, I think I may need to get back to the gym! We let it recover in the retainer and of it went back into the depths, I could not believe the way it looked in the water it was as wide as myself. I didn’t even bother putting the rod back out after that it was mission accomplished I’d hit the jackpot. I wasn’t going to get back to sleep after that, with 2 an half hours till we had to be packed up, I slowly started to tidy my tackle up and pack things away 8:30am all packed up and van loaded we headed around to the cabin before departure I was greeted with a massive well done and smiles I was still speechless from this achievement, because I didn’t get the bucket Nick came up with the idea I had to jump into the lake. So not to let the group down I manned it up got down to my duds 3 2 1… Splash what a way to end the trip, to have turned it around and pull 3 fish out of the bag in the last 14hrs with the jackpot been a unit 66lb of mirror carp that will take some beating. From start to finish the trip was one hell of an emotional rollercoaster full of ups and downs, I learnt a lot from this week long session…. take it as it comes and NEVER GIVE UP!!! !